Progress is rarely without bumps in the road, switchbacks and wrong turns. With the advent of the automobile came spooked horses and unemployed carriage makers. Eventually, we paved roads for cars, expanded into the suburbs and zoned business separate from residential. Oops! Then we realized the benefits of pedestrian- and biker-friendly roadways and of having businesses closer to homes. The culture of aging has likewise had its twists and turns. Medicine has extended our lifespan but not always the quality of life. Dual-income families have made caring for aging parents and grandparents more cumbersome. We want to remain independent in our own homes, but circumstances (including the aforementioned roadways and suburbs) make independence challenging. And contemporary medical philosophies and residential solutions often value safety and longevity over life satisfaction. Fortunately, today’s options include positive switchbacks, encouraging greater independence and life satisfaction for all of us who are aging. Home provides security, a sense of connection with the past and the satisfaction of independence. Naturally, then, aging in place has been found to improve seniors’ overall health, longevity and life satisfaction. It’s more cost-effective than nursing homes or assisted living facilities, even factoring in home-health services. And having our elders as part of the community rather than sequestered in separate locations provides benefits for all generations. 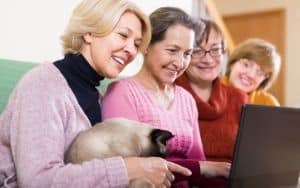 The first step in being able to remain at home involves having a home that’s safe, despite the changes that come with aging. One home-building trend, Universal Design, sets the stage for aging in place. 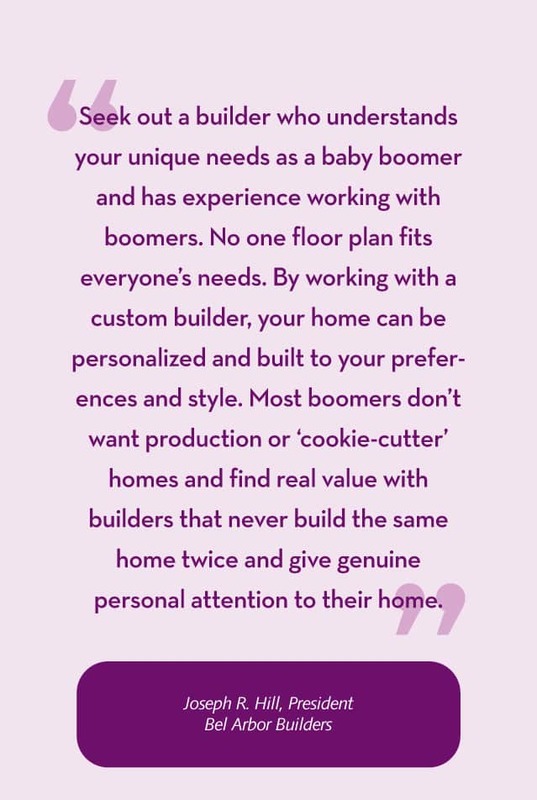 UD specialist Rosemarie Rossetti described the concept for BOOMER (August-September 2017) as “human-centered design, accommodating people of all sizes, ages and abilities.” In Universal Design homes, features include a variety of kitchen and bath countertop heights; no-curb, level-entry showers; wide door frames and minimal thresholds; easy-to-reach appliances, sinks, outlets and switches; and smooth but not slippery floors. Existing homes can be made more accessible, too. “The most important aspect of what we do is fall prevention,” says Lynn Ivey of HomeKeepers, which offers safety and accessibility consulting. 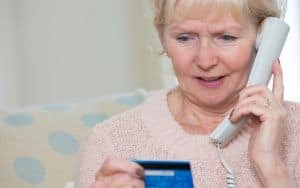 “A lot of statistics talk about the impact of a fall on someone over 65 and how that can dramatically affect their ability to stay in their home. 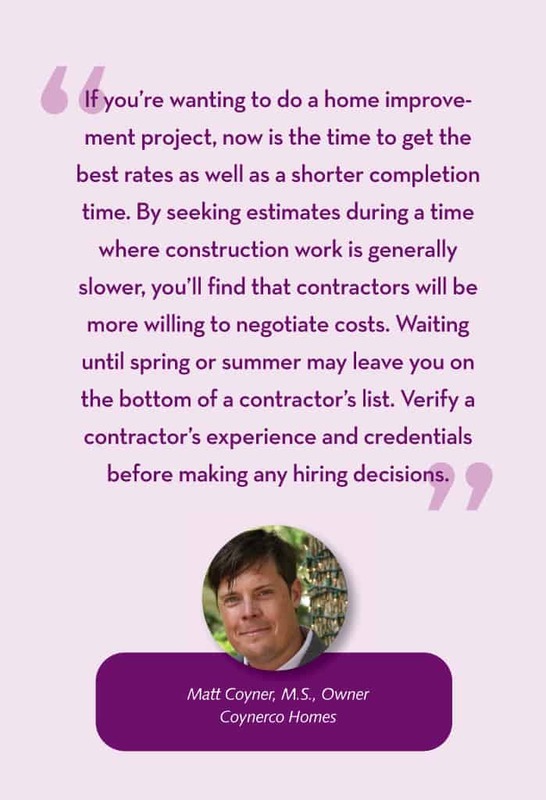 As part of our consultation service, we go into a home and look for things such as slippery rugs, high thresholds, thick carpeting, all of which provide opportunities for falls.” Consultants also look for spots appropriate for grab bars. Ivey notes that such modifications can be done proactively, for boomers and their aging parents. 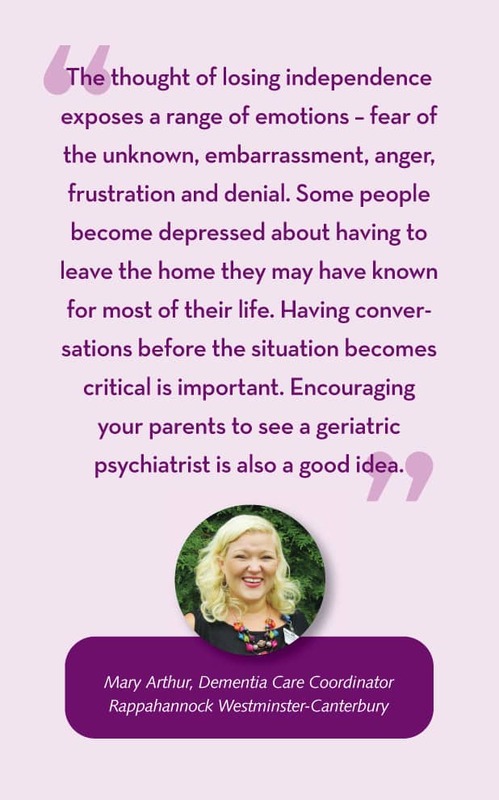 “We help families think down the road – you don’t need a walker now, but what would you need in terms of going through a doorway or walking down a hall.” Such modifications can enable a successful transition home after significant medical procedures. Residential property developers have responded to the aging of the boomer demographic by building age-restricted communities. These developments typically accept only residents above a certain age (such as 55) and include characteristics that appeal to this demographic. In describing the Villas at Dogwood off Hull Street Road in Chesterfield, Rina Dyer, marketing manager at Eagle Construction, points to features that are especially fitting for active adults: one-level living floor plans; low-maintenance homes; proximity to nearby stores and other conveniences; and a clubhouse for social gatherings. Roger Glover of Cornerstone Homes, which has developments in Chesterfield and Hanover, has responded to boomers’ preference for smaller homes. 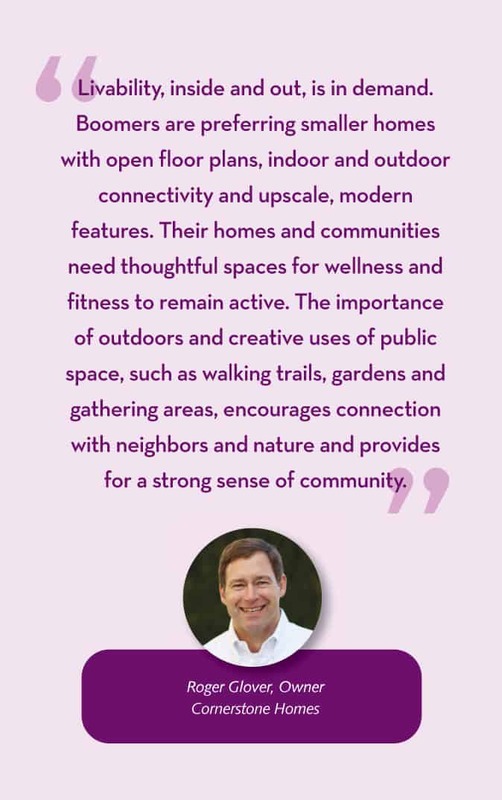 He also notes residents’ desire to stay active and connected. Cornerstone developments meet these needs with walking trails, gardens and gathering areas that encourage social connections. Independent living retirement communities provide another option for people who can live independently yet desire some services, including meals and activities. As a 62+ community, Dominion Place near VCU works with residents to assess and meet needs such as meal preparation, housekeeping and transportation to medical appointments. Dominion Place partners “with community agencies to link residents to needed resources for a high quality of life,” says Greg Ford. The community also offers a free, onsite wellness program, partnering with VCU to provide residents with health education, care coordination and medication management. On a smaller scale, a Golden Girls/Odd Couple concept brings individuals together under one roof. Typically associated with the young adult lifestyle, living with roommates can cut costs, trim maintenance responsibilities and provide companionship. In 2004, three 50-something women, Karen Bush, Louise Machinist and Jean McQuillin, bought a home together. Despite prognostications to the contrary, the women have enjoyed two decades under the same roof. In My House, Our House: Living Far Better for Far Less in a Cooperative House, the women share their experience and suggestions for how to achieve and navigate such an arrangement. Many contemporary services enable people to remain at home longer, providing at-home assistance with bathing, dressing, meal preparation and health care as well as adult day care outside of the home. But a livable community goes beyond the home and beyond the neighborhood to consider how the greater community can enable aging in place. The concept examines housing, transportation, health care and other services that support the challenges of aging and disability. 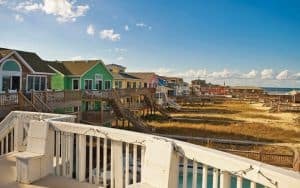 Many communities around the U.S. have become NORCs, naturally occurring retirement communities, in which a large proportion of neighborhood residents turn 60 or move in as seniors. A NORC doesn’t automatically enable aging residents to live there longer, but many such communities have acted to bring in supportive services that do help. In another trend, co-housing, communities are intentionally designed with private homes and shared spaces. On a spectrum between communes and planned communities, co-housing includes private ownership while expecting greater sharing of time and services than a neighborhood development. Aging in place indefinitely presents challenges, especially when residents become frail or lose their sense of balance or when advanced stages of dementia or illness set in. A variety of residential options with skilled services are available to meet people at various levels of need. A continuing care retirement community (CCRC) includes all levels of care. A resident might enter in an independent stage and live in an apartment or cottage and then later take advantage of a full range of care and services without needing to relocate. Recognizing the tension between the desire to remain independent at home and the need for care, Cedarfield has made changes toward “creating a more homelike atmosphere,” says Christy Walsh-Smith, director of marketing and community relations. “We have added a sidewalk café in our Healthcare Center, so that residents and families can sit and visit or get a bite to eat.” Cedarfield is also offering greater flexibility to its Cedar Grill dining options plus adding a pub with food and libations as well as a wellness building with lap pool, aerobatic pool, spa and crafts area. An assisted living retirement community offers help with daily tasks such as meal prep, dressing, personal hygiene, medication management, etc. Skilled nursing and rehab care provides full-time care in a facility designed for recovery from a hospital treatment or extended-need medical assistance (may be short-term and for many ages). A memory care unit specializes in meeting the needs of people with Alzheimer’s disease or other forms of dementia. Whatever we do today to promote and advocate for quality of life for seniors builds a foundation for the future – where each of us may be in a few short years.